This place, also called as Shimsa has well known world famous Gagana Chukki and Bhara Chukki water falls situated at around 140 km from Bangalore and 85 km from Mysore. 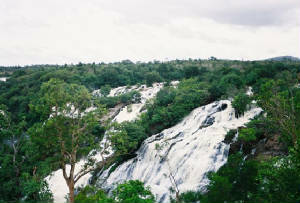 The water fall is from the river Kaveri in Mandya District. Shivana Samudra means 'Lord Shiva's sea'. 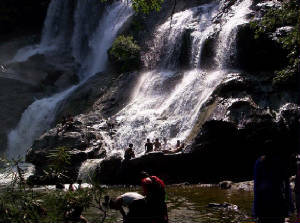 The island town of Shivanasamudra divides the river into twin waterfalls Gaganachukki and Bharachukki. The two falls are around 8 km apart. If you want to swim and play in water the best time to visit would be early summer. And to enjoy the real Majesty of the falls, you need to go in or just after the rainy season. The view of water splashing down is really amazing. Sparkling sightseeing of water scrolling down with an unseen speed from an enormous height on the rocks below is really a treat for the eyes. You can even cover Somnathpur and talkad in a one day trip if you have a private vehicle.